Two outwitting siblings. A sinister witch. Dancing gingerbread men. And, a house made of candy. This is what truly sets the tone for the most desirable kind of storyline in my opinion — when ‘good triumphs over evil.’ This week we welcome back guest blogger Diane McCormick. She spoke with original cast members of Central Pennsylvania Youth Ballet’s 2010 Hansel & Gretel about their thoughts and experiences in bringing this classic fairy tale to life. When ballet meets storybook, kids in the audience don’t care what’s real and what’s pretend, says dancer Julian Duque. They just want to be amazed. Duque knows. He remembers the gasps and cheers from Central Pennsylvania Youth Ballet’s first production of Hansel and Gretel. And so, like a popup book, CPYB’s Hansel and Gretel uses layer after layer of visual elements to bring a classic fairy tale to life. Costumes, sets, lights, and movement blend to engage audiences in the suspense and joys of good triumphing over evil. Audiences so loved the premiere production of Alan Hineline’s Hansel and Gretel, set to the evocative music of Edvard Grieg, that CPYB revived it in 2014. New to the 2014 production, CPYB partnered with acclaimed children’s literacy advocate Floyd Stokes for a pre-performance reading of Hansel and Gretel, from a version awarded the 1998 Caldecott Medal for artist Paul O. Zelinsky’s richly detailed imagery. Stokes is president of the Harrisburg-based, nationally recognized American Literacy Corporation, but he started his literacy mission as Super Reader, donning a cape and tights to take the delights of reading to children in preschools and elementary classrooms. Stokes knows the power of visuals to pull children into a story. One of Super Reader’s popup books about dinosaurs would draw oohs and aahs when he’d turn a page and a tyrannosaurus rex would appear, with giant teeth menacing. In the same way, Hansel and Gretel concocts a feast for the eyes, laden with dancing gingerbread men and a house made of candy. As the visuals and characters pull children into the story, they don’t care where real-life ends and imagination begins, says Duque. “When the gingerbread men come out to dance, they can’t tell if it’s a kid or a costume or a cookie,” he says. The classic story of Hansel, Gretel, and their parents remains relevant because the family endures the same struggles and trials facing today’s audiences, says Grace Snyder. 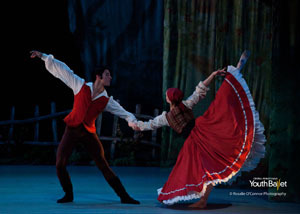 The CPYB alumna played Gretel in the 2010 production and is now a company dancer with the Alabama Ballet, Birmingham. When rehearsals were underway, she knew the basics of the story – “The kids go to eat candy and push the witch into the oven” – but Hineline’s staging gave the characters personality and motivations that drove every step of the story, she says. Snyder recalls that Hansel and Gretel forced her to stretch her acting technique. She had always easily played characters beyond her years, but at age 15, she was playing a mischievous child who overcomes some harsh realities. The exercise helped Snyder find “a more playful side” that she has incorporated into her professional career. Hineline softened the darkness of the original Brothers Grimm tale by using a light hand with the horror and building balance into the production. Hansel and Gretel has also been performed by Dance Theatre of Tennessee and will probably “continue its life” through productions elsewhere, Hineline says. 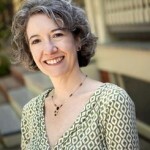 M. Diane McCormick is a Harrisburg-based writer and lifelong lover of the arts. She is a regular contributor to the Harrisburg Patriot-News/Pennlive, Harrisburg Magazine, The Burg, and Susquehanna Style.